The world has done well by corporate capitalism – a historically unprecedented period of economic growth and human development, with millions lifted out of poverty to name but a few of its achievements. But the sustainable growth which is necessary for economic prosperity and human development alike appears to be faltering. So, how should corporations adapt their strategy agenda to respond to this challenge? The challenge to corporations comprises not merely a moral imperative for successful corporations to give back, or to manage reputational risk prudently. The very growth which demonstrably generates the majority of corporations’ returns in the long run is under threat. If this claim sounds dramatic, consider the following facts: growth rates are trending downward globally, corporate investment levels are falling, start-up activity is declining and there is a political tide rising against one of the major drivers of growth, global economic integration. Furthermore, this could even be compounded by an emerging backlash against technology, another major potential growth driver, motivated by fear of its impact on employment and inequality dynamics. Addressing these threats will require not just setting different goals, but also adopting a different mindset. 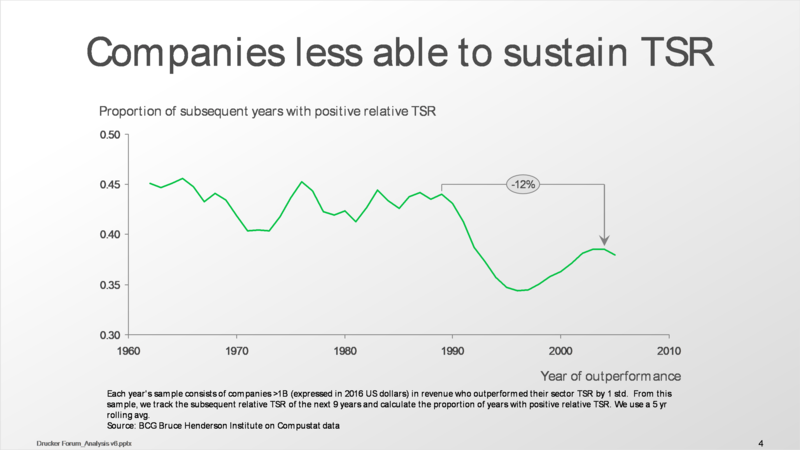 Business thinking has been dominated in recent years by the idea of maximizing Total Shareholder Returns (TSR). Such a philosophy is arguably appropriate to a situation where two conditions hold: 1) there are minimal externalities from business impacting the broader system beyond the company; and 2) the game is well established enough that emphasis on exploiting it fully makes sense, but not so mature that the exploration of new possibilities becomes critical. Clearly, these conditions do not hold today. Maximizing a rate of return which also incorporates expectations, creates an unsustainable ratchet effect. As the graph shows, after a period of high TSR performance, there is rapid regression to the mean. And the strength of the effect is increasing over time. This should not come as a surprise. Aristotle already distinguished between two species of economics. First, there is Chrematistike, or wealth maximization as an end itself, without constraints. Aristotle posited that Chrematistike is flawed as a model and likely to undermine society. He presumed that a better of model is Oikonomia, the art of managing a household, where financial considerations are subordinate to the higher purpose of family welfare. For Oikonomia the acquisition of wealth is merely an instrument to ensure well-being. We would argue that the latter approach is more appropriate to the current circumstances. In a straw poll at a recent World Economic Forum meeting of business and public sector leaders, all participants agreed that that a polarized society was the most likely, if least desirable, default outcome of expected developments in technology and work. This can be avoided only changing the current approach. So how should companies change their thinking and rewrite their strategy agenda to reflect the new circumstances? We suggest eight imperatives for such an agenda. Define clearly the purpose of each corporation, the higher social goal which it serves. This should be at the intersection between a need in the world, and a distinctive aspiration and ability to deliver it. This will address the self-limitations of pursuing TSR maximization as an end in itself. Diversify beyond the narrow metrics of TSR and GDP and adopt metrics which more broadly define wellbeing. We have suggested SEDA (Sustainable Economic Development Assessment) for societies and have recently released a report proposing TSI (Total Societal Impact) for companies. Invest in technology “front to back”. That is, stress growth and the fulfillment of unmet human needs, rather than the easier prize of cutting costs (and often jobs) in the back office. Some basic needs like education, healthcare and housing have increased in cost and the burden has fallen disproportionately on the less fortunate. Addressing such needs would make a good target for technological and business model innovation, leading to more broad based prosperity gains. Reeducate employees and citizens to make them better equipped to deal with changes wrought by technology. This would both reduce unemployment and alleviate talent shortages in emerging areas such as data engineering and artificial intelligence. Rethink and reshape the future of work. In particular, understand and redefine the role of employees in organizations powered by artificial intelligence. Support entrepreneurial business ecosystems. Corporations should rethink their global supply chains and business models in ways which create demand for services of the new and small companies which might not only be collectively major sources of employment but can also be a potent source of new ideas. It would also address the rising scale, concentration and complexity of incumbent enterprises. Communicate a new compelling narrative for globalization, technology and for business overall, which inspires confidence in a shared future. As narratives shape perceptions and political reality, which in turn shape economic reality, business leaders have the opportunity to take an active stance and influence the direction of our societies. Creating the conditions for sustainable growth is a challenging task. Some leaders especially in younger companies appear to be already active in trying to build this new narrative and reality. Now, the challenge and opportunity for established companies is to extend their own longevity and growth prospects by doing the same. Martin Reeves is a BCG senior partner in New York and director of the BCG Henderson Institute. Bob Eccles is a visiting professor at Said Business School at Oxford University and Claudio Chittaro is a consultant in the BCG Henderson Institute.